Compusult's line of highly innovative, cost effective, workplace adaptation and assistive technology solutions. Compusult serves the accessibility and workplace adaptation markets by providing innovative hardware and software solutions for people with special needs. We carry a complete line of Compusult designed and manufactured assistive technology and workplace adaptation products, in addition to many innovative AT solutions by other manufacturers. 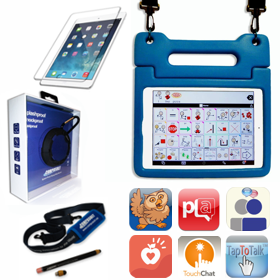 A high-quality portable Augmentative and Alternative Communicator (AAC) bundled solution that can be customized to include an iPad or select Android device, pre-installed with various AAC software, as well as accessories such as an EVA2 protective case, tempered glass screen protector, carrying strap, ergonomic metal stylus, and the iGo Bluetooth wireless portable speaker. The EVA2 protective case is a sleek and appealing shield for your device. This soft, easy-to-hold foam-based case is simple to carry and protects your iPad or select Android device from drops and tumbles. It features a completely redesigned handle and integrated dual angle stand to provide improved stability, better viewing options, and easy attachment of Compusult's carrying strap and stylus. Compusult’s Mobile Accessory Bundle comes with a variety of accessories for your iPad or select Android device. Each bundle includes an EVA2 protective case for the devices, Compusult’s tempered glass screen protector, an optional carrying strap, an ergonomic metal stylus, and the iGo Bluetooth wireless portable speaker. Switch Controller that can be combined with the Jouse3 to activate devices in the user's environment. The USBox allows computer-controlled switching of external devices and features four SPDT Relays controlled by a USB port on your computer. The 2-Switch is a miniature USB-based switch controller for two selected mouse actions, two selected keyboard inputs, or one mouse action and one keyboard input. The 2-Switch mouse actions and/or keyboard inputs can be customized. The 5-Switch is a compact USB-based switch control unit which allows users to perform various mouse actions through the use of five external 3.5 MM switches connected to the front of the unit. SPOT is a high-quality sip-and-puff switch that requires no power source. SPOT can connect to any device that accepts standard switches using a 3.5 mm connector. Talking, reading, singing and playing with your child is important to their development. Find out more about or selection of Learning, Literacy and Play products such as the Interactive Sensory Blanket, Animal Puppet Wash Mitts and the Portable Literacy Game.